Esthesioneuroblastoma (olfactory neuroblastoma) (ENB) is a rare neuroepithelial tumor that arises from the olfactory epithelium in the cribriform plate or nasal cavity. First described in 1924 by Berger and Luc,  it has a histological pattern similar to that of sympathetic ganglia, retina, and adrenal medulla  and only recently  became recognized as a distinct pathological entity, probably, as a result of immunohistochemistry and by means of electron microscopy techniques. They have helped to differentiate ENB from similar undifferentiated nasal cavity tumors. ENB accounts for 1 to 5% of malignant neoplasms of the nasal cavity. Fewer than 1000 cases are reported in the world literature,  and most of the reports were in small series. Unlike most other neuroectodermal tumors, which manifest in childhood, ENB has a bimodal age distribution between 11-20 years and 51-60 years. The symptoms are related to site of origin and invasion of the tumor. The staging system with stage A, B, and C based on tumor extension presented by Kadish et al.,  in 1976 has been widely accepted. Recently, Morita et al.,  justified a modified classification with stage D tumors, presenting metastases in cervical lymph nodes and at distant sites. Two other staging methods, the Biller method  and the Dulguerov method,  have also been described and used. The optimal treatment modality for ENB continues to be debated because of limited cohort size case series and treatment inconsistencies for this rare tumor. Surgery and radiotherapy (RT) are still used by some institutions as single modalities despite the lack of support for single-modality treatment regimens, , while many other institutions favor surgery followed by RT. ,, The use of combined modality treatment with surgery, RT, and chemotherapy in various combinations has been increasingly adopted over the past few years. 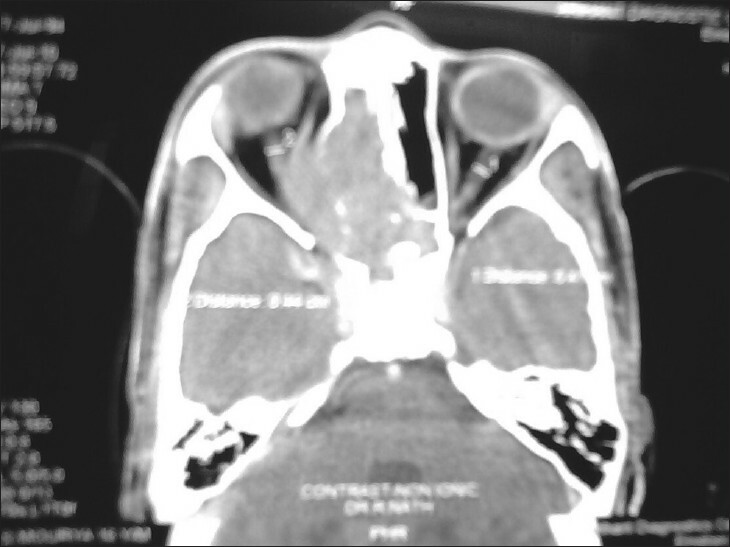 , We are reporting on a rare presentation of ENB presenting with proptosis (without any nasal symptoms) along with bilateral cervical metastasis. 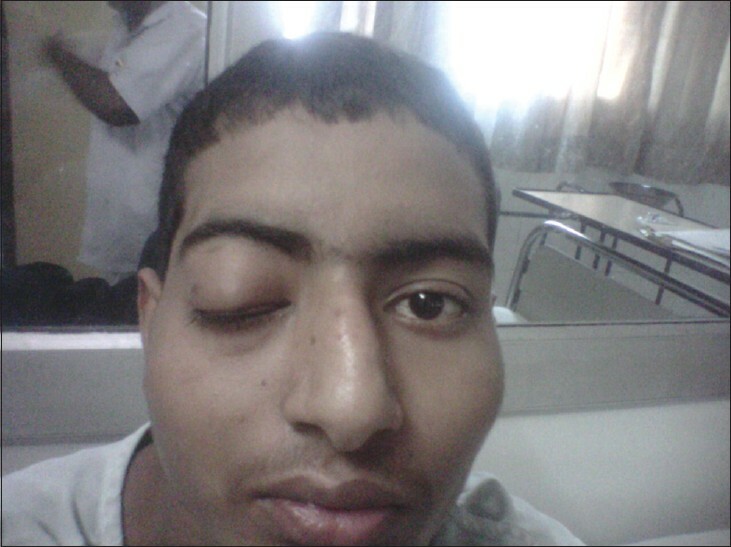 A 17-year-old adolescent male patient presented to Ear, Nose and Throat Out-Patient Department (ENT OPD) with complaints of right eye proptosis and loss of vision for last 20 days [Figure 1]. There was no history of nasal obstruction or epistaxis. Patient also complained of bilateral non-tender neck swelling for last 7 days. On examination, nose was normal on anterior rhinoscopy, but perception of light in right eye was absent. The right globe was fixed in all directions and relative afferent papillary defect (RAPD) was also present. Left eye vision was normal. Coronal [Figure 2] and axial [Figure 3] cuts of contrast enhanced computerized tomography (CECT) scan of nose, paranasal sinus and orbit showed heterogeneously enhancing soft tissue density involving right nasal cavity, anterior and posterior ethmoids with erosion of cribriform plate and with right intraorbital extension. MRI of brain and orbit was done which showed Kadish stage C extension. Both T1 and T2 showed heterogenous signal intensity with dural enhancement along with involvement of right orbital apex and intraconal part of right eye. 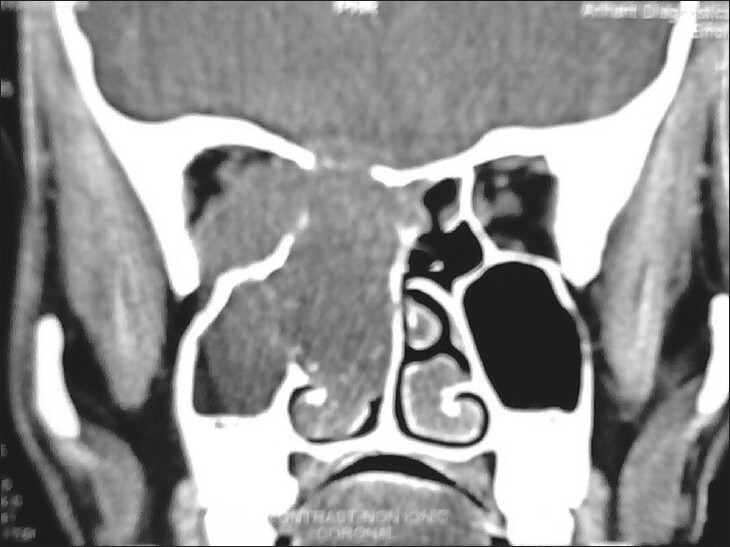 Patient underwent a nasal biopsy which was sent for histopathological examination (HPE). HPE report revealed small, round cell tumor forming Holmer-Wright rosettes suggestive of olfactory neuroblastoma. Fine needle aspiration cytology (FNAC) was also done from bilateral cervical level II lymph nodes which showed them as metastatic. In view of bilateral lymph nodes, radiotherapy consultation was sought and patient was put on external radiotherapy. The tumor responded very well to radiotherapy and both the metastatic lymph nodes and proptosis of right eye subsided within one month of starting radiotherapy. The patient received 66 gray radiation (Gy) in 33 fractions of 2 Gy a day for 5 fractions per week. Total treatment lasted for 7 weeks. At 1 month follow-up post radiotherapy, patient is clinically normal without palpable cervical lymph nodes and his proptosis has also decreased. He is on regular follow-up and according to the patient, his appetite and his weight has also improved after treatment. The Kadish system,  the classic staging system, used to predict overall morbidity and mortality from ENB, does not specifically mention retropharyngeal metastatic disease. Stage A tumors are those confined to the nasal cavity. Stage B tumors extend from the nasal cavity to the paranasal sinuses. Stage C tumors extend into the orbit, base of the skull, with or without intracranial extension. This system has been advocated by some, because of its simplicity and acceptable prognostic efficacy. Other classifications have been proposed that specify which paranasal sinuses are involved, if there is extension into the cribriform plate, and the size of the tumor. Morita et al.,  proposed a Kadish D stage that adds further distinction to ENB involving the cervical lymph nodes like in our case. Two other staging methods, the Biller method  and the Dulguerov method,  have also been described and used. In conclusion, ENB is a very uncommon malignant tumor arising from olfactory epithelium that may have a long natural history characterized by frequent local or regional recurrences. It may have bizarre presentations including proptosis only or proptosis along with nasal symptoms. The presence of bilateral cervical lymph node metastasis in ENB has not been mentioned in the literature, contrary to our case, and it should be kept in mind in future. Radical craniofacial resections by a multidisciplinary surgical team combined with adjuvant radiotherapy with 50-60 Gy is probably the most usual treatment with some modifications according to the disease and the patient profile. The role of systemic chemotherapy in the treatment of distant metastasis should be further evaluated before being used as the standard treatment. 1. Irish J, Dasgupta R, Freeman J, Gullane P, Gentili F, Brown D, et al. Outcome and analysis of the surgical management of esthesioneuroblastoma. J Otolaryngol 1977;26:1-7. 2. Berger L, Luc G, Richard D. L' esthesioneuroepitheliome olfactif. Bull Assoc Fr Etud Cancer 1924;13:410-21. 3. Stewart F, Frierson H, Levin P, Spaulding C. Esthesioneuroblastoma. In: Williams JG, Krikorian MR, Green D, editors. Textbook of uncommon cancer. Oxford: Wiley and Sons; 1988. p. 631-52. 4. Broich G, Pagliari A, Ottaviani F. Esthesineuroblastoma: A general review of the cases published since the discovery of the tumour in 1924. Anticancer Res 1997;17:2383-406. 5. Becker L, Hinton D. Primitive neuroectodermal tumors of the central nervous system. Hum Pathol 1983;14:538-50. 6. Kadish S, Goodman M, Wang C. Olfatory neuroblastoma: A clinical analysis of 17 cases. Cancer 1976;37:1571-6. 7. Morita A, Ebersolod M, Olsen K, Foote R, Lewis J, Quasqst L. Esthesioneuroblastoma: Prognosis and management. Neurosurgery 1993;32:706-15. 8. Biller H, Lawson W, Sachdev V, Som P. Esthesioneuroblastoma: Surgical treatment without radiation. Laryngoscope 1990;100:1199-201. 9. Dulguerov P, Calcaterra T. Esthesioneuroblastoma: The UCLA experience 1970-1990. Laryngoscope 1992;102:843-9. 10. Rinaldo A, Ferlito A, Shaha AR, Wei WI, Lund VJ. Esthesioneuroblastoma and cervical lymph node metastases: Clinical and therapeutic implications. Acta Otolaryngol 2002;122:215-21. 11. Resto VA, Eisele DW, Forastiere A, Zahurak M, Lee DJ, Westra WH. Esthesioneuroblastoma: The Johns Hopkins experience. Head Neck 2000;22:550-8. 12. Chao KS, Kaplan C, Simpson JR, Haughey B, Spector GJ, Sessions DG, et al. Esthesioneuroblastoma: The impact of treatment modality. Head Neck 2001;23:749-57. 13. Constantinidis J, Steinhart H, Koch M, Buchfelder M, Schaenzer A, Weidenbecher M, et al. Olfactory neuroblastoma: The University of Erlangen-Nuremberg experience 1975-2000. Otolaryngol Head Neck Surg 2004;130:567-74. 14. McElroy EA Jr, Buckner JC, Lewis JE. Chemotherapy for advanced esthesioneuroblastoma: The Mayo Clinic experience. Neurosurgery 1998;42:1023-7. 15. Koka VN, Julieron M, Bourhis J, Janot F, Le Ridant AM, Marandas P, et al. Aesthesioneuroblastoma. J Laryngol Otol 1998;112:628-33. 16. Harrison D. Surgical pathology of olfactory neuroblastoma. Head Neck Surg 1984;7:60-4. 17. Pickuth D, Heywang-Kobrunner H, Spielmann R. Computed tomography and magnetic resonance imaging features of olfactory neuroblastoma: An analysis of 22 cases. Clin Otolaryngol 1999;24:457-61. 18. Bastin K, Steeves R, Gilchrist K. Esthesioneuroblastoma: Diagnosis, prognosis and treatment. Wis Med J 1993;92:17-9. 19. Shaari C, Catalano P, Sen C, Post K. Central nervous system metastases from esthesioneuroblastoma. Otolaryngol Head Neck Surg 1996;114:808-12. 20. Cantrell R, Chorayeb B, Fitz-Hugh G. Esthesioneuroblastoma: Diagnosis and treatment. Ann Otol Rhinol Laryngol 1977;86:760-5. 21. Eich H, Star S, Mickle O, Eich P, Stutzer H, Muller R. Radiotherapy of esthesioneuroblastoma. Int J Radiat Oncol Biol Phys 2001;49:155-60. 22. Polin R, Sheeran J, Chenelle A. The role of pre-operative adjuvant treatment in the management of esthesioneuroblastoma: The University of Virginia experience. Neurosurgery 1998;42:1029-37. 23. Eriksen J, Bastholt L, Krogdahi A, Hansen O, Joergesen K. Esthesioneuroblastoma What is the optimal treatment? Acta Oncol 2000;2:231-5. 24. Doyle P, Payton H. Combined surgical approach to esthesioneuroepithelioma. Trans Pa Acad Ophthalmol Otolaryngol 1971;75:526-31. 25. Weiden P, Yarington C, Richardson R. Olfactoy neuroblastoma: Chemotherapy and radiation for extensive disease. Arch Otolaryngol Head Neck Surg 1984;11:759-60. 26. Hyams V, Batsakis J, Michaels L. Olfactory neuroblastoma. In: Hyams V, Batsakis J, Michaels L, editors. Tumors of the upper respiratory tract and ear. Washington: Armed Forces Institute of Pathology; 1988. p. 240-8. 27. Goldweig H, Sundarsean N. Chemotherapy of recurrent esthesioneuroblastoma: Case report review of the literature. Am J Clin Oncol 1990;13:139-43.